It was in post war Britain that the Raleigh Sports really came of age as it was a lighter and "sportier" alternative to the heavier English roadsters and remained in production well into the 1980's. It was the "All Steel bicycle" and for most of it's production life was fitted with a Sturmey Archer AW hub although through 1957 and 1958 it was fitted with the poorly designed and ill fated SW hub. The 1950's were the peak of Raleigh production and quality and they were a household name in most of the English speaking world and on this side of the pond they were referred to as English racers. But they were never racing bikes. This was a well made and sturdy utility bicycle that was designed to last 100 years and they did not see many changes during their production life... latter models have alloy stems and brakes and the Superbe was always completely fitted out with generator lights and a locking fork which brought it's weight up to 42 pounds without a full chain case. I know this because I owned a 1978 model and only sold that when I could no longer ride in an upright position due to a back injury. My Superbe roadster... my friend now enjoys this bicycle and it has been his daily driver for several years and still looks even better than it did when he received it as it now sports a new honey brown B66 saddle and matching Brooks saddle bags. I also owned a beautiful 1948 Rudge roadster which was Raleigh made but because of my back issues decided to sell it to a young lady who is longer of leg than I and enjoys this bike immensely. So for the first time in many years I found myself without an English 3 speed and that could never do as my daughters and I love riding our English three speeds together. A friend gave me a bedraggled 1954 Raleigh Sports a few years ago and I just had not found the time to extract a frozen stem and set to work on bringing this bike back to life. Over the past few weeks have been working on my new ride. In 1954 the Sports was fitted with the now obscure EA1 wheel (597mm rim) and as my Lenton is fitted with these I know the challenges of finding suitable tyres. The wheels on the Sports were not the beautiful stainless models and were rather thrashed... the front wheel was beyond repair. I knew the bike would accept a 650A or 26 by 1 3/8 wheel and tyre as the difference between this and the EA1 is only 8mm but the options for high performance 650A tyres is pretty much nil. I pondered building up some 650B wheels but thought I should try using a 700c wheelset first, having seen that a number of people have performed this conversion. The bike came together rather quickly (once I removed that frozen stem) and I took pictures throughout most of the process... I don't think I have taken this many pictures of any bike I have built or owned. Rideable enough to take home to my new shop. We went on our first ride yesterday afternoon and it was absolutely wonderful... riding usually relieves a lot of back pain as it does not engage my muscles as walking, sitting, and standing do but this was something else. Or the new bars and plush tape... I did upgrade the bars, stem, and brakes as well. The bike itself came together so nicely... all the parts were things I had kicking around... the 700c wheels, the proper English Bluemel fenders, the new brakes and old levers were all here. And once again, I have an English 3 speed... that I can actually ride... and if one did not know better they might think this bike always looked this way as it accommodates the wheels and tyres so nicely. And it rides like a Raleigh should... beautifully. I expect this bike to see 100 at which point I will be 89. Beautiful Bike. I have rebuilt a '71 Schwinn World Traveler into a touring single speed. All cleaned up well and the new stuff went together well. Except the fenders were a lot of work. I also had large tires 700x35's Yours look tight as well. Any trouble aligning the fenders? +1 Beautiful bike and story. Good inspiration for me and my still unfinished English 3-speed resto project. That put a smile on my face. Lovely build. Very nice. 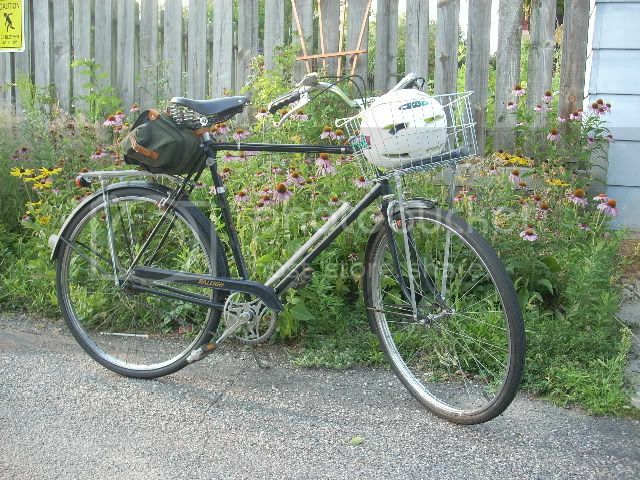 And speaking of English 3-speeds, is anyone else here planning on riding the Lake Pepin 3-Speed Tour in May? My wife and I are signed up. I'll be on my 1973 Superbe, and my wife will be on her 1974 Sport. I love the Sportsters. Great build, Sixty-fiver! Beautiful bikes, all of them. In strange twist of fate I now own a 1972 Raleigh Superbe myself. These still within the range of the most preferred Superbes? Beautiful build and very enjoyable post. I went the same route as you regarding wheels, EA1 to 700c on my Raleigh Trent Sports. The change in wheel size works well and the selection of tires is fabulous. It's odd how I continue to "shop" for my ultimate life-time bike but whenever I ride one of my old Raleigh 3-speeds, I think to myself that I've already found it. But, I still continue to look. PG. I'm rebuilding the wheels with Sun CR-18s right now, and ordered fulcrum stops and shift wheels from the STO. I can't wait for spring, though I rode my Triumph yesterday, dodging the potholes and the puddles. Lake Pepin 3-Speed Tour - that is charming. Maybe one of these years. When I get discouraged about the rebuild I'm doing - all the work, all the challenges - it's threads like this one that renew my motivation. Thanks, all! Tell me, please, Bicycle Repairman, what you know of the Raleigh Tourist. I bought one here in UK, blue with white head tube, scruffy vinyl Brooks ( ? the low point of Brooks' history), 26" wheels with Westrick rims (very rusty), Sturmey 3 speed (which aint working properly and needs dismantling and cleaning), front dynohub, and all transfers present and "patinated". So it is pretty original. And man, is it heavy. I was planning on doing it up but haven't yet. Is this the year of the 3 speed racer? I love these bikes, too. How is the top tube length on yours, Sixty Fiver? I imagine it's not as cramped with drop bars as it is with upright bars. My knees just about hit the grips. Enjoy what you have. 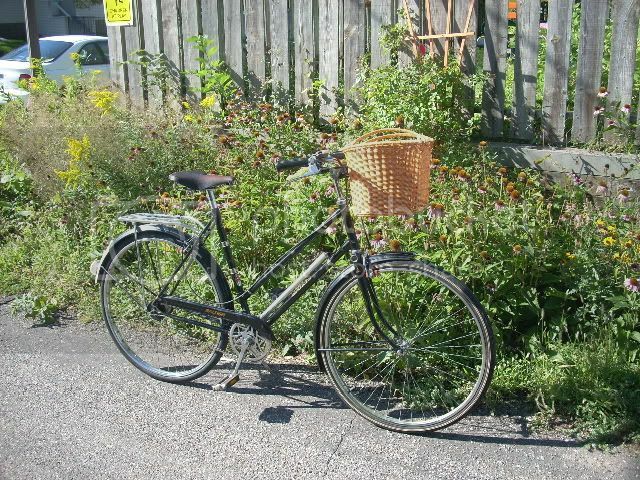 I have several 1970's vintage Raleighs, including a nice 1972 Superbe. I think the older ones were of higher build quality, but certainly the 70's bikes were better than the ones that followed. Kurt - When it's a little nicer I will put the girls together for a side by side shot but this is as close as they will get for now. The Lenton is an inch taller at the head tube than the Sports but is still riding on it's EA1 wheels which puts both bikes at nearly identical standover heights and the room in the bikepit is almost the same. The geometry is very similar if not identical... both bikes have relatively short rear stays as they were built for a smaller wheel. I am pretty sure the straight gauge Sports weighs less than the Lenton which is a 531 frame... before I added the fenders and swapped out the bars and brakes it was 26 pounds on the scale from the loo. The Lenton's did not come with the lovely heron chain wheel but rather have a swappable 1/8 track chain ring on a 3 bolt spider as these were used for everything to commuting to time trials and club racing. The Lenton could have also been purchased as a three speed for a few pounds more. The Bluemel fenders fit wonderfully on the Sports and there is still good clearance between them and the 700:32 tyres which are some run of the mill Duro Proteks... they have a vintage look and I have had good success with these tyres. The Lenton uses the same fenders and you can see how much extra clearance there is in the frame. I am not sure how these new parts would fit into a modern Sports as the geometry on the '54 might be just a little different, I do know that you cannot use the stock steel fenders in a 700c conversion. And of course, because I built a fair weather and rain bike... it is now snowing. Both bikes fit me like an old glove and they really suit my style as I am not one for pristine garage queens but rather, those old bikes that have seen some miles and bear the patina of age... the Sports frame is really scruffy and will need some expert touching up to protect the frame and the old decals.